Paper gift bags are differentfrom all other types of bags because they are universal - they are used for packing gifts and are sold to the end customers. We manufacture 30 original models in 4 basic sizes. Every model has been developed in the design studio and is oriented to a specific target group of customers. 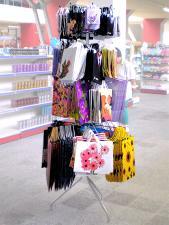 We also offer to supply a metal holder for better displaying of the bags in supermarkets, flower and souvenir shops. We also offer shelves that are made to order for places where our standard holders cannot be used.